Sweater weather and pumpkin spice season has finally arrived! The temperature is dropping in New York and the leaves are changing. Fall fashion is great, but fall themed treats and drinks are even better! We listed some of our favorite places to check out in NYC before these seasonal treats are gone! Fall comes in all forms of food, deserts, and even cocktails. 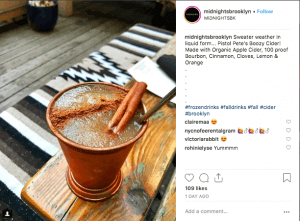 If you are looking for a fall inspired cocktail check out Midnights Brooklyn located in Williamsburg. They are now offering a boozy cider made with Organic Apple Cider, 100 proof Bourbon, Cinnamon, Cloves, Lemon & Orange. You can find plenty of farmers markets all over New York City, but my personal favorite time to go to farmers markets is during the fall time. 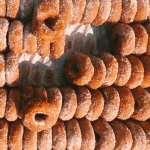 Grab a cup of apple cider, eat apple cider donuts, and even pick out some pumpkins! If a PSL isn’t for you, check out Saltwater Coffee in the East Village and grab their Maple Latte. 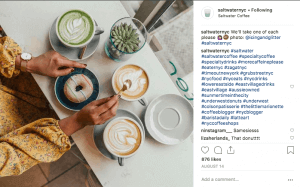 Another alternative for a fall themed coffee and also this coffee shop is definitely Insta-worthy. Don’t forget to snap a pic on the inside! 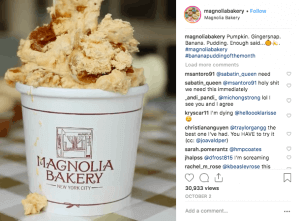 Magnolia Bakery has come out with a seasonal take of their infamous banana pudding (my personal favorite) and for a limited time they now are serving pumpkin gingersnap banana pudding. I went there last weekend and tested it, and I can personally say that it was worth every penny. They also have pumpkin cheesecake, pumpkin spice cake and more! 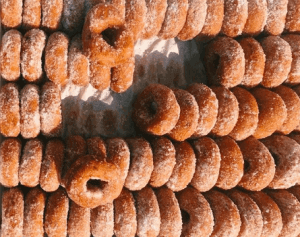 A couple of weeks back I made the trip to Downtown Brooklyn to taste these Doughnuts that my dad saw on The Food Network and let me tell you they did not disappoint. 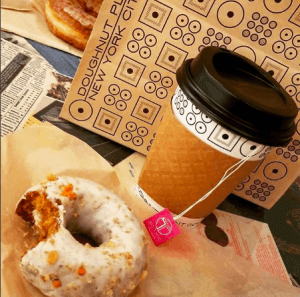 They had seasonal pumpkin spice, and apple cinnamon cake donuts and paired with a latte it was the perfect fall breakfast. Happy Fall eating everyone! Let us know if you check out any of these spots!